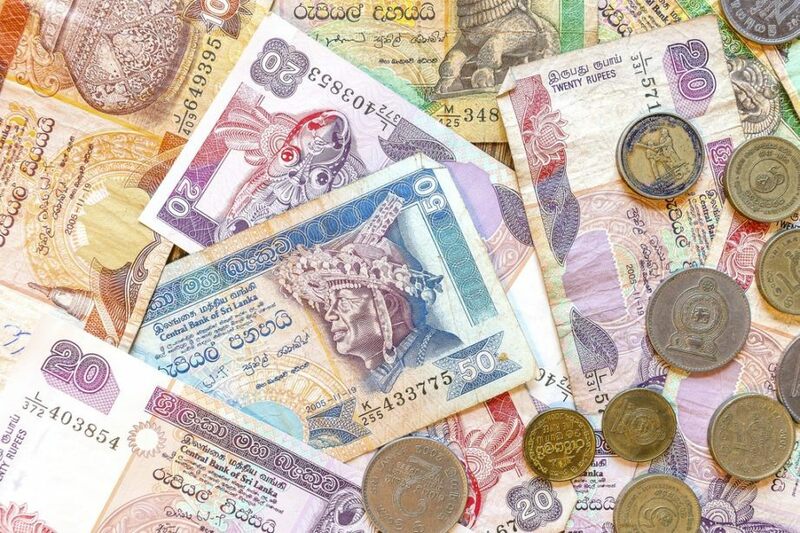 Sri Lanka’s currency history stretches back thousands of years from ancient coins to colonial currency. Today Sri Lanka has overcome inflation, civil war, and natural disaster to reduce poverty and post some of the highest levels of growth in the region. Sri Lanka has minted its own currency for centuries, stretching back to pre-modern times. The oldest coins were issued by local rulers or traders and were similar in appearance and material as other coins minted on the Indian subcontinent. Despite some initial academic debate, the Lakshmi plaques – so called because they depict the goddess Lakshmi – are now unanimously believed to have been early coins from the Chera Dynasty from around 500 BCE. Each coin is rectangular and between half an inch and three inches tall. The three Tamil dynasties (the Pandiyan, Chola, and Chera) which ruled much of Sri Lanka and southern India from about 300 BCE to around 1650 CE each minted coins depicting wildlife, sacred symbols, and other imagery. European arrival in Sri Lanka brought new coinage. The Dutch East India company began minting copper coins in the native language, imitations of native imagery and often the Dutch East India Company monogram. By the 1700’s the Dutch East India company was issuing coins in denominations of ⅛ duit, 1 duit, 4 ¾ stuiver and 1 rixdollar. After the British took over Sri Lanka (then called Ceylon) they quickly released copper ‘dump coins’ – so called because they were crudely struck – in denominations of 1/48, 1/24, and 1/12 rixdollar in 1801. The following year higher quality coins were added, although dump coins continued to be circulated and minted. In 1803, 24, 48 and 96 stivers coins were minted in silver, and eventually a 1 rixdollar coin was minted in 1821. 5 rixdollar notes were released in 1809, followed by 2 rixdollar notes in 1826. Although the Ceylonese rixdollar continued to be circulated, it was replaced for official accounting purposes in 1825 by the British pound at a rate of 1 pound to 13 ⅓ rixdollars. Treasury notes were released in 1827, and the Ceylonese rixdollar was finally demonetised in 1831. In 1836 the Indian rupee became Ceylon’s standard currency, although pound notes continued to circulate and the pound remained the official accounting currency at a rate of 1 pound to 10 rupees. The Bank of Ceylon issued banknotes in 1844, and the British treasury notes were officially withdrawn in 1856. 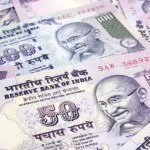 The rupee was decimalised in 1871, and became the official currency in 1872, replacing the pound at a rate of 1 rupee to 2 shillings and 3 pence. After independence in 1948, the Central Bank of Sri Lanka was founded in 1950, and the Sri Lankan rupee soon followed in 1963. The current series of notes is the Development, Prosperity and Sri Lanka Dancers Series. 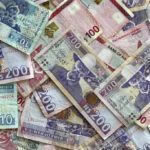 The Sri Lankan rupee is pegged to the USD which is adjusted in response to economic conditions in the country. 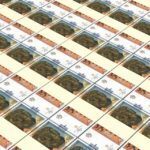 The rupee traded at LKR 16.53 to USD 1 in 1980, but was devalued against the USD in the ensuing decades to LKR 40.06 in 1990, LKR 77 in 2000, and LKR 145 by 2016. Sri Lanka enjoyed yearly growth of 6.4% from 2003 to 2012, besting many other economies in the region. Sri Lanka’s GDP per capita is also better than many regional rivals at US$3,818. In 2015 the country posted a growth rate of 4.79%. Poverty in Sri Lanka has declined from 23% in 2002 to 9% in 2009. Sri Lanka’s economy faced 25 years of civil war and insurgency which began in the 1980’s, as well as natural disasters like the 2004 tsunami. Towards the late 2000’s inflation hit as high as 20%, but stabilised following the end of the civil war in 2009. Sri Lanka’s most important sectors are tourism, tea, rice, textiles and apparel, and agricultural products. The US is the country’s primary export partner. Over 26% of exports find their way to America, while 24.6% of good imported into Sri Lanka arrive from India. Sri Lanka has overcome inflation, war, and natural disaster, and is now focussed on long term strategies to build a middle income economy. Learn all about Sri Lanka with our Country Profile and Travel Guide!